Amerisleep is a pioneer in sleep innovation, and has revolutionized manufacturing with the world’s most eco-friendly foam creation process. The company’s sales structure delivers savings directly to the customer by cutting out the middleman and selling directly, transforming an outdated buying process into a simple, cost-saving experience. From product development to selling, Amerisleep keeps the single most important idea at the forefront of its decision making process: customer comfort. From its inception, Amerisleep focused on rewarding its customers that evangelized the brand to their friends and family. It had a referral system in place prior to bringing on Extole, but it was very informal and completed manually. Brand representatives would identify if customers were referred during the checkout process, and would then contact those advocates to thank them for their referral and reward them with complementary products or financial incentives. This exceptional brand experience paired with an outstanding product caused Amerisleep’s loyal following of customers to grow at a rapid pace. Traffic to the site increased radically and daily orders went through the roof. Amerisleep knew it needed a better way to manage its referral system in order to keep up with the increased success the brand was experiencing. Amerisleep looked at all available advocate marketing options, and the company determined that Extole was the best fit for the brand. Extole provided the research and benchmarking, robust platform, and dedicated support team that Amerisleep required for its advocacy program. Amerisleep sought to leverage Extole’s platform to automate its refer-a-friend program to achieve maximum customer acquisition success and avoid the resource drain it experienced while managing the program manually. Amerisleep first implemented a soft launch to test Extole’s platform internally to ensure the campaign ran seamlessly. The company funneled the share program to a specific landing page and implemented 50% of the marketing that Extole suggested it use. The program was up and running at full steam in no time at all. With Extole, Amerisleep extends the ease and comfort it provides with its product into the sales cycle. The brand ensures a seamless user experience on its site by promoting the refer-a-friend program in the footer of its homepage, offering a prominent, but not overpowering, call to action. 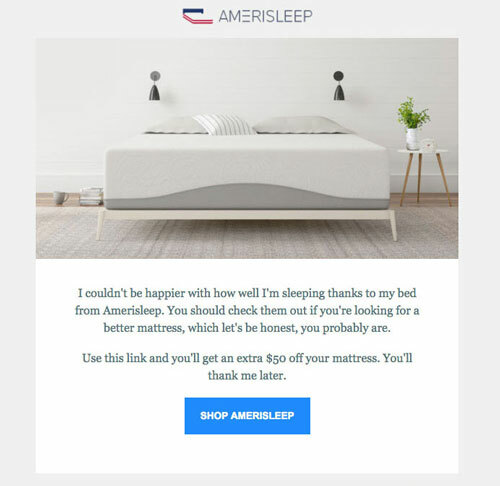 Customers are then brought to a unique landing page where Amerisleep showcases its rewards for referral. Advocates are rewarded with a $75 Visa gift card when their friends make a purchase, and friends are given $50 off their first mattress purchase. The company’s program is so successful that it hasn’t needed significant outside marketing. Customers find the Amerisleep brand experience so enjoyable that they are happy to promote it organically. After the initial implementation of Extole’s platform, Amerisleep wanted to further boost the visibility of its referral program and develop another avenue for customer acquisition. The company built a unique wing within its standard advocate program in order to identify advocates of higher value and reward them appropriately. This program takes the same innovative approach to advocate marketing that the company takes to mattress development. Using Extole’s platform, Amerisleep identified members of its community who demonstrated a greater intrinsic value to its brand and developed a separate program that provides unique rewards for their overwhelming commitment to Amerisleep. Through this innovative approach to advocate identification and reward, Amerisleep is able to increase conversion rates. This strategy streamlines the advocacy process similarly to how direct selling streamlines the mattress-buying process. Normally, it’s difficult for mattress brands to build customer advocacy because mattresses aren’t bought at a frequent enough rate, especially mattresses of Amerisleep’s quality. However, by identifying advocates of greater value through Extole’s platform, the brand can drive in more conversions and further its reach into previously untapped markets. 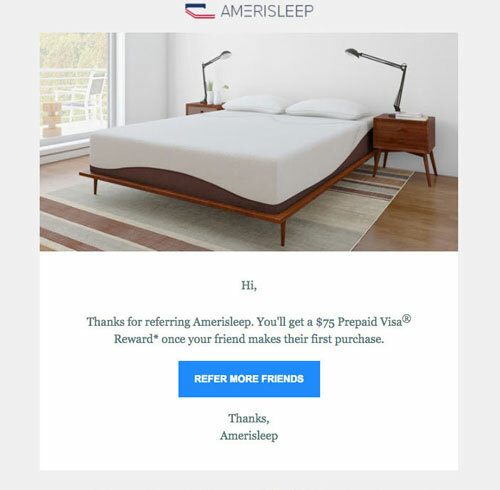 In one instance, Amerisleep’s advocate marketing program enabled a customer who bought her mattress through Amerisleep four years prior to share her amazing experience, putting the weight of her personal reputation behind the brand and endorsing it to her friends and family. With Extole’s platform, Amerisleep can continue to scale its advocate marketing to meet its growing needs. The brand is currently expanding globally with agreements in Australia and South Korea. Amerisleep plans on continuing this expansion and is working to get its mattresses into new countries to test the growing demand it’s seeing from the success of its advocacy program. With Extole, the brand will bring its program to eager advocates around the world who want to share the ease and comfort that Amerisleep mattresses provide.